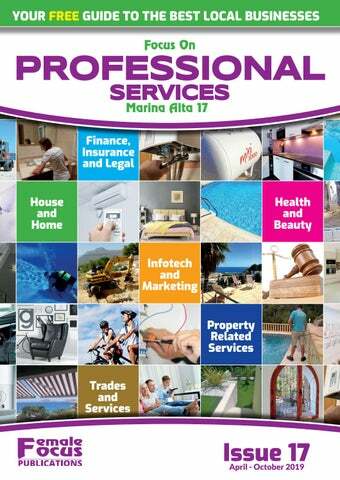 Welcome to issue 17 of the Professional Services Magazine, the Nº1 business guide in the Marina Alta region dedicated to showcasing local companies and professionals in your area. Keep it to hand because you never know when you will need to use one of the trades, products or services offered. Remember, you can also view the Professional Services magazine as a digital version at www.femalefocusonline.com with the added bonus of direct ‘live’ links to the advertisers’ websites and emails. And now if you are on the move and need a number or address and don’t have a magazine to hand just go to business.femalefocusonline.com where you will ﬁnd all the businesses with full contact details, google map directions, and some even include their latest offers linked via Facebook. I have the shortcut saved to my mobile home screen so I am never without a number. 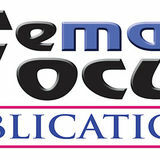 Did you know Female Focus Publications, established in 1993 is the largest and most experienced English language magazine publisher serving the Costa Blanca community. We have very loyal advertisers and readers of all nationalities including British, Dutch, Scandinavian, Spanish, German, Russian, etc. A brief over view of our FREE magazines:All magazines are printed using quality A4 gloss paper. Female Focus:- 15,000 copies distributed monthly from Oliva to Villajoyosa – The largest free magazine in English on the Costa Blanca. QF Focus Magazine:- 10,000 copies distributed monthly from Gran Alacant to San Javier. Professional Services MA & VB Magazines:- 15,000 copies per issue every six months throughout the Marina Alta and Vega Baja regions in two separate issues. Pick up your FREE copy locally or see the digital versions at www.femalefocusonline.com. Published by: Female Focus S.L. Dep. Legal A-686-2016. C.I.F. B-53845459, Aptdo. de Correos 532, Calpe 03710 (Alicante). Web:- www.femalefocusonline.com, email:- advertising@femalefocusonline.com. Tel: 96 587 5421. The publisher cannot legally accept any responsibility for any misrepresentation, claims or errors that may occur within this publication. The reader should check all claims before completing a transaction. The publisher cannot be held responsible for advertisements reproduced from poor quality artwork or inadequate instructions for text layout. © 2019 Female Focus SL. All rights reserved. Printed by:- Indugraf Offset S.A. Tel 97 729 6477. Rentals 2019 & 2020 Trust your property to Professionals Aguila Villas is an internationally orientated rental agency with many years of experience in rentals and maintenance of holiday homes. Aguila Villas offers all services and care to you as an owner and to the families that rent your holiday home. With more than 35 years of experience and know-how, Aguila Villas is the best choice. For more than 25 years Aguila Villas has specialised in holiday rentals of villas with private pools, holiday homes and apartments in Javea, Denia and surroundings. Whether you want to get the most out of your holiday home or to have your second home available for rentals only for short periods per year, Aguila Villas is the right rental partner for you. We offer a customised maintenance and rental plan in which we aim for a perfect balance between taking care of your property, your own use of it, and the best return from rental revenues. WE MAKE IT POSSIBLE Trust us with your rental property! Aguila Villas takes care of the enquiries, bookings, payments, handling and the extensive marketing of your holiday house, villa, apartment or finca, making sure your home is rented in a profitable way. Our office in Jávea not only specialises in holiday rentals. We can also organise all kinds of other matters for you, such as maintenance of garden and pool, housekeeping, repairs, painting, renovations but also should you ever want to sell your home, you have come to the right place. Interested? Contact us to discuss the many possibilities of generating extra income for your property in a secure and comfortable way. Telephone 966 470 830 or visit www.aguilarent.com. TIRED OF LOOKING OR CAN’T FIND YOUR DREAM VILLA? We can help you create it Our Architectural Engineer can accompany you on initial viewings, to give construction proposals that you might not thought possible prior to purchase, we work closely with estate agents to ﬁnd the right property for you. GOT THE RIGHT LOCATION BUT WITH THE WRONG HOUSE? We have inspirational design ideas We are able to deliver all your design, construction and maintenance needs from a garden wall to a new build villa. We can produce all necessary detailed drawings, Spanish documentation and realise your dream, removing all the stress. LOVE WHERE YOU LIVE BUT NEED TO... · EXPAND · ADAPT · RENEW? Whatever your needs - We can help. We pride ourselves in offering a complete building service, covering every aspect of design and construction and the obtaining of all necessary consents and licences. OUR AIM IS OUR CUSTOMER’S COMPLETE SATISFACTION We are on hand every step of the way With 30 years’ experience designing and constructing properties both in the UK and on the Costa Blanca, at New Life Construction we aim to take the stress away from our clients through every job. We provide a full FIXED price written detailed quotation. We ensure that your completion date is met and that you are fully satisﬁed with our services. We are an English family team that have been successfully managing villas in Moraira and surrounding areas for over 15 years. This area is perfect for families and friends who wish to enjoy a stress free, enjoyable and relaxing holiday. Demand continues to grow for well cared for villas with an experienced management company on hand 24/7. After all, if something goes wrong on your holiday, you’d want it seen to as soon as possible. We personally meet guests into the villa and are on hand to help them get the most from their holiday. We live in the area ourselves so personal attention is never too far away. We welcome back the same guests year after year, often to the same villas. People want holidays they can trust, as do villa owners who want a villa rental team they can also trust. At Moraira Villa Holidays, we’ve earned your trust over the last 15 years, call us and see what we can do for you. We’d love to hear from you. THINKING OF SELLING YOUR PROPERTY IN JAVEA OR JESUS POBRE? THEN PLEASE CONSIDER US! OUR EXCLUSIVE LISTINGS BENEFIT FROM : · PROFESSIONAL INTERNAL AND EXTERNAL PHOTOS · AIRBORNE IMAGES OF PROPERTY AND GROUNDS · 3D GRAPHIC FLOOR PLANS. CONTACT US FOR FRIENDLY, NO NONSENSE ADVICE AND A FREE, NO OBLIGATION VALUATION. If you are buying property in Spain or have problems with a property you already own, a professional structural survey can help identify and record defects whilst suggesting effective remedial solutions and cost implications. Mark Paddon BSc Hons. MCIOB. CAAT. is a British Building Surveyor and Spanish registered Arquitecto Tecnico, insured via Lloyd’s of London. He has been working on the Costa Blanca and Costa Calida for over 15 years carrying out buyer’s Structural Surveys and providing general property purchase and defects advice, including expert witness reports for court actions and insurance claims (Thermal camera inspection is also included). Whether it’s an old town house, apartment or luxury villa, every property purchase represents a considerable investment and deserves a close inspection for defects such as damp, termites, subsidence etc. Specialist structural assessment of problem retaining walls and swimming pools is also undertaken. Fire risk assessments and pre-expiry 'Decenal' (Builder's Guarantee) inspections available. Free buyer’s guide available via website. Initial telephone and e-mail advice is free. Costa Blanca is out..... the secret about the best deals on the The personal service from fully trained insurance advisors. We will talk you through a tailor made policy to meet your exact needs and budget, allowing you to cut out the middle man by dealing direct with a Spanish insurance company in English. Our job is not only to get you the right policy but to ensure that any claims are dealt with as quickly and with as little disruption to you as possible. Known for doing that bit more that bit cheaper! C.C. Perlamar (3rd ﬂoor) · Avda Gabriel Miró · 03710 · Calpe I am Linda Townsend and I am a lawyer. I studied and qualiﬁed in Spain. For over thirty years I have been solving people’s problems from my ofﬁce in Calpe. Having successfully joined forces with Fernando Ferragud, another reputable and long standing law ﬁrm, we are delighted to be able to offer the widest range of legal services. With our bilingual assistants Liza and Virginia, we have always dealt with general civil law matters, such as drawing up tenancy agreements, purchase contracts, and so on, but there are three particular areas in which we specialise, and these are: conveyancing, inheritance and tax matters. With bilingual Fernando and multilingual Heidi we will now be able to offer assistance in these same matters to German and French speakers also. Fernando also has many years’ experience in court cases, whether administrative, criminal or civil. Heidi is currently ﬁnishing her own Spanish degree in Law. We are proud of our family-like business and our aim is to make you feel comfortable and at ease from the moment you enter our ofﬁce. We will try to help to solve any problems you may have, no matter how small or comparatively insigniﬁcant your case may be. Any advice we may give you will be aimed at putting your mind at rest. We look forward to meeting you in the near future. Inﬁnity International is an independent leading provider of foreign exchange services to private individuals and businesses. Whether you’re buying property overseas, purchasing high value items from abroad or making regular monthly transfers we can save you money. There will be no unwanted surprises when trading with us as there are simply no fees to pay on the foreign exchange services we offer. Opening an account is very easy and fast too, it can be done in a just a few minutes. You will be appointed your very own expert Personal Consultant who will spend time understanding your needs and your goals from the outset. They will also be at hand every step of the way to explain the process in jargon free English as well as giving you complete peace of mind that your money is being handled in the safest possible way. You have trusted us with your money and we will repay that trust by working hard and ensuring we have the right tools to make sure your money is delivered on time every time. Register Online and receive a 25€ Amazon Gift Voucher when you book your ﬁrst trade*. Inﬁnity International is registered by the FCA under the Payment Services Regulations 2009 for the provision of Payment Services. Attention Nail Technicians. We’re so excited to have become the ofﬁcial distributor for TheGelBottle in Spain and have had such a good response. Nail Techs love the colour range, the different ‘glittery’ shades, and our unique “builder in a bottle”. Equally as important, our community have commented that with our larger bottles, the product goes further which is great for the economics of their salons. Our new 20ml bottles are designed to hold maximum product and provide up to 100 applications per bottle. So not only will your customers love the extensive range, they’ll appreciate our “10Free” credentials, 100% recyclable packing and the product is vegan and cruelty free. With more and more customers expecting products to be delivered, you can rely on MAIL BOXES ETC to get the shipment to its destination on time. What’s more, we will go out of our way to make sure packages get to their destination on time by personally tracking your shipment. Time for renewal? Then travel no further than MAIL BOXES ETC. Don’t have time to wait for the delivery guy? Fed up with waiting in and the delivery comes the next day? We are a UPS Access Point meaning you can ask for your delivery to come to us and then pick it up at your convenience. Simple, easy and above all, convenient! The Passport Renewal Service that suits your circumstances, quick, easy and reliable. We’ll soon have you on your way. Avinguda de Parìs, 33 El Arenal, 03738 Jàvea, Tel. 865 645 490 Pack | Ship | Design | Print | Photocopy | Laminate | Passport Renewal | etc. Our main showroom in Jávea is open daily from 9.30am - 5.30pm (we don’t close for lunch) and 10am - 1pm on a Saturday. The PC-Highway sales and technical team are very proud of their pre and after sales service (you pay for the call, the advice is free). Before making any purchase why not call in to discuss how we can be of assistance. le COOLING YOUR HOME THIS SUMMER Save money and stay cool all summer long by keeping your air conditioning unit maintained. Catch small problems before they become big problems. If you require an annual air conditioning service, please contact us to schedule an appointment. RELIABLE HOT WATER If you’re thinking about getting a new boiler, it’s important to know the different types and how they work. The size, type and brand of a boiler can all affect how much energy you consume. We can help make choosing the right boiler for your property a breeze. Providing you with all the information you need. POOL PLUMBING Don’t just think about heating and cooling the inside of your property, think about the outside too. We can install most types of Pool Heating and Pool Pump systems at competitive prices. RQBS has an exceptionally committed team of highly qualiﬁed staff who pride themselves on customer satisfaction from the project’s start through to its completion and even beyond by providing an excellent after sales service. RQBS has long been established on the Costa Blanca and has built up an excellent reputation in Jávea and the surrounding areas for providing the Quality, the Building and construction expertise, and the one to one personal Service that their discerning customers have come to expect. Their comprehensive list of services includes; • Extensions, remodels and reformations, rooﬁng, under builds, terraces, patios and driveways, boundary walls, fencing, railings, etc. • All aspects of electrical and plumbing work, re-wiring, air conditioning, central heating systems, gas or oil boilers and water heaters. • Pool, sauna and Jacuzzi installations. • Bathroom and kitchen design and installation, tiling, false ceilings, etc. • Carpentry, pergolas, wood windows, internal and external doors. • Aluminium and Upvc doors and windows. • Wrought iron gates and railings, BBQs, automatic gate openers, etc. Achieving customer requirements and objectives are of paramount importance to RQBS , hence they also have an architect on board who covers all aspects from initial design and consultation to the important paperwork and licensing issues. RQBS have already successfully completed many projects over the years which include everything from minor works to major remodels and are more than willing to supply testimonials from their continually expanding client base. Please contact RQBS for your no obligation quote. Moraira Plumbing & Heating is a family run business that has been established on the Costa Blanca since 1998. With Ray’s City and Guilds training expertise and around 40 years’ experience in the plumbing, heating and construction industry, his work is carried out to the highest standards of efﬁciency and quality, offering a fast and reliable service using only the best quality materials. Sometimes with all the new ideas on the market, the design and installation of a new bathroom, heating system, air-conditioning, pool heating etc., can be a ‘real headache’. You will ﬁnd no problem when you visit Moraira Plumbing Heating as they can design, install and advise, so all the worry is just lifted from your shoulders. The professional team has many years of experience in installing bathrooms, showers and heating systems, including all necessary building work, tiling, electrics or decorating. MPH always endeavour to ensure that any necessary additional tradesmen required will be available, so that the project will run smoothly and swiftly, causing you and your family the minimum of disruption. It all begins with a free site survey when you will be advised of the best type of products for your particular plumbing system or indeed, how to change your system to suit the products you choose. You can then visit the showroom where you will be offered help and advice to select the right bathroom or shower etc and then you will be given a quote for the overall price for the complete project. Once determined, the materials will be ordered and stored for you until the conﬁrmed ﬁtting date. Hi there, my name is Stewart and I would like to introduce you to my house paint company The Villa Painters. We have been trading continuously since 2006 and are anticipating the next ten years with conﬁdence and optimism. We have achieved our success by constantly delivering a high standard of ﬁnished job through the exclusive use of premium quality products and meticulous attention to detail all of which inspires trust in our clients. Most importantly we maintain a business model ﬁrmly grounded on low overheads and efﬁcient working practice which ensures that we can offer our prospective clients a top class product at a low cost which is extremely good value. Don’t therefore, put off having your house painted. It doesn’t make good economic sense! Instead call me today or soon and ﬁnd out exactly how affordable a top quality fully guaranteed house paint really is. With over 40 years’ experience as a professional motorbike mechanic, and since 2007 on the Costa Blanca/ Marina Alta Peter Zwaan undertakes top quality servicing, maintenance and repairs, for all makes of motorbikes and also is a specialist in complete overhauls. His one-stop shop, PETER ZWAAN MOTORBIKES, based in Pedreguer on the N332, has extremely convenient access to the AP-7 Motorway (exit 62) and parking. SHOWROOM for (preowned) motorbikes ACCESSORIES (clothing and helmets) WORKSHOP (specialist in BMW/computer diagnostics) Other facilities include: TYRE SERVICES (only supply and ﬁt) RENTAL STORAGE (long-/short- term) pre-ITV inspections/visits Opening Hours: organised RIDE-outs domestic PICK-UP SERVICE. Mon - Sat: 10 am - 2 pm, Besides English, Dutch and German, Peter speaks Spanish after 2 pm by appointment and can therefore also arrange: Closed Sunday Change of Ownership (transfer) Spanish matriculacion (Imports/exports) Change-over to Spanish driving licence and Insurance. If you need professional help on ANY aspect of MOTORBIKE OWNERSHIP in Spain, then contact : PETER ZWAAN MOTORBIKES. We have been working in Spain and France for 15 years. Our speciality is building new, or renovating, villas and apartments, swimming pools and terraces. We also conduct structural repairs for major insurance companies. Our focus area is Costa Blanca North from Gandia to Alicante. We guide our clients through the whole process from concept to completion including licencing and design. Why not give us a call to discuss your ideas. “Building quality from the ground up” Call now for a no obligation quote. ay cool at home and at work! •Huge range of quality systems to choose from •Keeps you cool in summer and warm in winter •Domestic or commercial including multi-room •Full re-gas, repair and maintenance service There are many Aircon companies, so why choose Mundo? Well, quite simply, we care. What is unique is our approach to your needs and after sales service. We’re always more than happy to go the extra mile, spend the time to listen to your needs - and ﬁt the air-conditioning system YOU want - and to be on hand to provide routine maintenance, and on-going repairs as required. All you want is to switch the Aircon on and adjust your room temp! All we want is to make that as simple, easy and reliable as possible! We spend a lot of time researching the latest technology and new developments in air-conditioning to ensure you get the best! Control those careless Holiday Makers Window and door sensors turn aircon OFF when the window’s open! Specialist Machine Hire / Groundwork, Septic Tanks and Soakaways. More than 30 years experience. Complete septic tank installations from start to ﬁnish including help with licences and permissions. Style and perfection is our promise. Isaacs Renovations. A team of professionals with over 30 years’ experience in the building trade both in the UK and Spain. We are building and renovation specialists. We work with architects and designers for those extra ﬁnishing touches. Our work projects are bespoke and individually tailored to each client with quality and workmanship. Every job is project managed from start to ﬁnish. Our competitive prices and reliability are key. Insurance work undertaken for those unforeseen circumstances. 965 874 944 685 678 965 Drips & Leaks offers a full range of all plumbing and drainage services, whether it be domestic or commercial works. For all plumbing and drainage services we use the best quality materials, complete them with the highest standards and make sure to still give you low prices. Our qualiﬁed team of experts are always equipped and prepared to deal with any of your plumbing and drainage needs. Our vehicles are very well equipped to undertake small works, extensive repairs and installations. Drips and Leaks offers We specialise in the UNDETECTED all types of domestic and unblocking of all types of LEAKS CAN commercial services and drains using high pressure COST YOU 000€’s completes all works to the water jetting equipment. Our Drips and Leaks team very highest standards. We can provide fully are all fully equipped detailed surveys, Whether it’s a leaky tap with the latest in leak using the latest CCTV or completely reﬁtting detection equipment so equipment to repair and plumbing a bathroom. we can easily locate your damaged drains. Our experienced team broken pipes in order Drain repairs/Unblock of plumbers can fulﬁl all to easily ﬁx them in the your possible plumbing High pressure jet cleaning most efﬁcient and cost and heating needs. effective way, saving you Septic tank repairs & installations time and money. Drips and Leaks are Living in Spain gives us equipped with top of the a unique opportunity to range CCTV cameras to harness the power of the allow the inspection of sun to heat our water. your drainage systems so It’s efﬁcient, it’s planet that we can determine friendly and with Drips their condition. and Leaks it’s easy to install. Our surveys are done by inserting the camera into SAVE ON ENERGY BILLS the blocked drain so we AND SAVE THE PLANET. are able to see it properly We offer a range of and determine exactly systems to suit all sorts where the pipe is blocked. of dwellings, from apartments to ﬁncas. SERVICES Sovereign Construction specialise in residential property refurbishment and our company is founded on over 30 years of experience. At Sovereign Construction, attention to detail and commitment to quality sets us apart from other construction companies. Our projects have ranged from €250,000 reforms to client’s ﬁrst projects while maintaining the same level of commitment and professional service throughout. You are in trusted hands. We want to EARN your business. As one of the Costa Blanca’s leading building companies, our main strength is based on providing a complete solution, from initial concept right through to the ﬁnal build. 99% of our work is kept “in house”, so you can be assured of that personal touch. Fully up to date with the latest ideas to provide complex and sophisticated solutions based on innovative construction approaches and across different disciplines, we offer our clients assurances that your dreams and needs are calculated with precision and at the highest standard. This well established and reputable company covers every aspect of construction and reform. We cover all areas from Gandia Benidorm and inland. A portfolio of previous work backed up with client references is available. Andrew is a fully qualiﬁed and experienced electrician. He has a wealth of experience, a vast understanding of his profession and the ability to resolve your electrical problems safely. Andrew offers a friendly and reliable service where all work undertaken is fully guaranteed and no job is too small. You can be assured of a ﬁrst class service that will have your electrical problem sorted out quickly, safely and in accordance with current regulations. Don’t get charged up, ring Andrew for a FREE no obligation quote. A D Lawton Construcciones Take a look at our website for more information or give Alan or Emma a call for advice. Established in Jávea since 2006 - covering the Costa Blanca - A D LAWTON has all of your plant hire needs to hand. Our extensive range of diggers and other machinery means you need look no further - whatever your requirements. A D LAWTON has as excellent reputation providing extensive knowledge and expertise in all construction, drainage and excavation related work. Our range of excavators means we can satisfy almost all groundwork and excavation requirements, even those hard to reach places. We specialise in drainage and groundworks and have a wealth of experience in this ﬁeld. Alan has over 30 years’ experience in groundworks and heavy civil engineering and Emma is a Civil Engineer with years of experience in drainage and waste water treatment. We have been involved in numerous installations of septic tank systems and the drainage associated with them and can carry out the complete works ‘in house’ from start to ﬁnish. Inspire - Design - Create CCM SERVICES aims to fulﬁl all your property’s demands by providing services ranging from a 1-off boiler repair to achieving your dream home... and anything in between. No job being too big or too small, our company always strives to perfect your property according to your desires. Our Managing Director will oversee all work to ensure the personal touch that larger companies lack. Inspire - Design - Create Our multi-lingual staff are at your ﬁnger tips, so obtaining the results you desire has never been so easy. We care for our customers by providing competitive pricing, dedicated customer service, innovative methods and solutions to your property needs. With our team of professionals regularly working to deadlines and offering competitive prices direct from suppliers, we ensure your full satisfaction upon ongoing works and completion of the project. With well over 14 years’ experience of building on the Costa Blanca, we know that Spanish houses just aren’t built to cope with the damp. We see so many cases of ‘wet walls’, horrendous black mould, and that tell-tale bad smell. We can treat all properties for rising damp, or any kind of leak or excess damp. Underbuilds are a speciality. All work is carried out by our own skilled and experienced tradesmen. If you have a damp problem, call us on 675 589 669 and we’ll arrange to come round and do a thorough survey for FREE. All work is quoted in advance and is guaranteed. Handycall Construction is a member of the CBBA, so you can trust us to say what we do and do what we say - our reputation has been built on it for the last 14 years! Based in the Costa Blanca but with satisﬁed clients all over Europe, Adam Sanabria is a qualiﬁed NIC-EIC electrician, who is proud to be amongst the very few British electricians to be approved under Spanish regulations. Performing a complete range of electrical services, from a plug to a complete building re-wire, you can be sure that all work will be carried out professionally to the highest quality and safety standards, and all with a friendly smile. If you have any questions, call Adam today. SURGE PROTECTION All it takes is a lightning strike NEAR your home (not even a direct strike) or an over-voltage, and you run the risk of damaging any electrical equipment connected at that moment. We can ﬁt a surge protector unit, to help keep you safe from all electrical surges. Call us for more info. We offer an extensive fault-ﬁnding service, and of course ﬁx them as well! With differentials (RCD) that self-reset, so your appliances work, even after a power-cut! Reduce ﬁre and electrocution risk with replacement of old and dangerous wiring. Extend your electrical distribution safely! No more ugly extension leads. NEW DIGITAL METER CAUSING PROBLEMS? If your power keeps going off since you’ve had a new digital meter installed, we can solve your problems by upgrading your supply. All paperwork and red-tape is handled by us in-house, taking the hassle out of your upgrade. We’ll take care of it all! Our smart switches automatically work out if there really was a problem and if not, resets itself! Avoid lost freezer contents, alarms re-arm themselves, security lights work, etc. Ideal if you’re away a lot. Your 1-stop shop for goods and services on the Costa Blanca... The Costa Blanca Business Association (CBBA) is comprised of a group of local businesses, all legally registered and accountable in order to ensure you can give your business to one of our members with conﬁdence. Supplying a wide variety of trades and services, from building to web design, all our members work hard to achieve our aim of providing high quality goods and services at competitive prices. JOIN US Networking that Really Works If you’re in business and you’re looking to increase your client base, then consider joining the CBBA. The ﬁrst step is to visit us at one of our fortnightly meetings and see what it’s all about. To let us know you’re interested, or to ﬁnd out more about the CBBA or one of our members, please visit our website www.cbba.es where you’ll ﬁnd more information, as well as how to join the leading networking and referrals group on the Costa Blanca. We use the latest equipment and mulching machines to condense the waste - saving on skips - making this the most affordable option for site and plot clearance. We work in association with Digger Services to provide a complete Specialist Landscaping and Land Clearing service. tanks and gas bottles and is unique in being MEMBER the only expat company fully licenced, in these areas, with the Spanish authorities. Established for over 25 years on the Costa Blanca our team is comfortable with Spanish building and plumbing methods and regulations. We offer free advice and no obligation quotations. If you need help or wish to beneﬁt from our huge wealth of knowledge and experience, please call us or visit our website. Follow us on Facebook. everything we do has to be done right! Mills Plumbing & building Services has been established in Jávea since 1998. We do everything from kitchens and bathrooms to drainage and building. Trust is the most important thing for us and we’re proud that over the years, our customers demonstrate that trust by keeping coming back asking us to do more work. With more than 20 years’ experience, and the fact that we work in the Spanish system, we speak and understand the language and know what it takes to get the job done. Our mantra is everything we do has to be done right, which means you can be conﬁdent that you’ll get a job done right, at a fair price, and on time. Call us for a quote. Brush Strokes is one of the longest established painting and decorating businesses on the Costa Blanca. Based in Jávea and covering the area between Benidorm and Gandia we have built up a reputation for supplying top quality work at a reasonable price using top quality materials. We provide a reliable service with Free Estimates and all our work is totally clean.  Woodwork We do not require any payment in advance, only when the client is 100% satisﬁed that the work has been completed to the highest standard. We  No job too small are fully legal and carry Third Party Insurance liability. Testimonials are  All works guaranteed available. “For over 15 years Brush Strokes has been the chosen painting ﬁrm for the 76 dwellings at Los Lagos Urbanisation near Jávea. We annually use Brush Strokes because of their helpfulness, attention to detail, tidiness, and the quality of their work, paint and ﬁnishes. Highly recommended”. R Cunningham, Urbanisation President · 2012 - 2017. Biggest English plastering company on the Costa Blanca. ‘We can fully plaster a villa in one week.’ Are you fed up with those awful, tired looking, dirt catching, knobbly walls in your home or the horrible outdated rough cast render ﬁnish to the exterior? Coney Plastering ran a very successful family plastering company in London and now is offering its English standards to the Spanish market. Plastering is a tradition for the Coney family with skills of master plasterers being handed down for the past four generations. Coney Plastering will turn your old style interior and exterior walls and ceilings into a smooth and modern English style ﬁnish. We also a plastering on to tiles (bathroom/ kitchen). Coney Plastering only use Spanish materials which are specially designed to deal with the rigours of the Spanish climate, so there are no cracks or other problems that can occur from imported brands. Coney Plastering prides itself on its punctuality and cleanliness of work. Before each job is started they cover all ﬂoors, doors and other important surfaces so that when they areﬁnisheditisjustasimplecleanupandthey’re off leaving your house the way they found it. Coney Plastering are also experts in: Monocapa / Rendering All aspects of ﬁbrous (coving and moulds etc) Polished (marble) Drywall ceilings + walls Thermal boarding Laying of microcement on ﬂoor and walls They are recommended by and work with the best builders in the area. References are available on request. By using the right tool for the job you will do it quicker and better! Taking care of your home as if were our own! We started off as Glass Act and soon gained a reputation for the best window cleaner - commercial and domestic - in the Costa Blanca. Due to our caring professional approach we have been asked to take on more and more work until we realised that we were so much more. Our team of highly professional and courteous workers recognise that your home is your castle and we’re here to keep it that way. We offer a range of services including our original window cleaning to total property care & maintenance! In most people’s eyes, the difference between a nice house and a beautiful house is the garden. From landscaping to weekly maintenance, we offer a full service. We talk things through, share advice and experience freely, all so you can enjoy a wonderful garden and a beautiful house. Our head cleaner comes with years of experience and a list of references that anyone would be envious of! We never forget to retain a personal relationship. In fact many of our customers consider us their extended family. We offer a weekly, fortnightly or monthly service to suit your needs. Paint jobs are carried out by our team of experienced painters, complete with care, precision and above all cleanliness. Whatever your needs, we’ve got you covered! The range of services we offer is vast, from tiling terraces to hanging ornaments on your wall, indoor decorating to chain-link fences. Our local Pool team will keep your pool in tip top condition. • Check pool water chemistry. • Empty various baskets. • Skim water surface of debris. • Brush tiles around the pool. • Top up with water if needed. • Check ﬁlter pressure. • Vacuum pool. • Check for any damage & notify owners. Tired of looking at old tiles, wondering how on earth you can clean your stone walls? With our state-of-the-art pressure washing system we can get it looking as good as new! The difference can be staggering. And if by chance we uncover a problem, well we’ve got that covered too with our maintenance team! They say that in business you don’t get a second chance for a ﬁrst impression! As business owners ourselves we know the importance of a clean ofﬁce or shop! With our team of trained cleaners we can offer a disruption free cleaning schedule to suit you: daily, weekly, or even monthly. We offer a professional, reliable and courteous service since 2014. Using traditional window cleaning techniques we clean your windows to the highest standard, be it at regular intervals or the ﬁrst time in 25 years (true story!). All types of shops, houses, villas etc. If you need your windows cleaning call us! Due to our care and attention, many home owners have asked us to take care of renting their villas for the lucrative summer season. We of course take a ‘class-act’ approach by making sure everything is ready and legal, from licences to checking in guests. Cycling is fun, it’s healthy and it’s for all the family. We have 3 shops where we stock everything to do with bikes, from road racing to family fun. There’s been a recent surge in Electric Bikes and for good reason. You get all the beneﬁts of cycling but without all the huff and puff going up hills. We stock a wide range of e-bikes in our Moraira stores with more than 20 models in stock to suit all requirements, from beginner to enthusiast. It doesn’t matter if you’re just starting out, or a seasoned rider, we’ve got you covered. Simply pop in and speak to one of our enthusiastic and helpful staff and start enjoying life on 2 wheels!  Aluminium and UPVC Windows and Doors in a variety of colours including imitation wood grain plus....  Conservatories and Glass Curtains  Wind Breaks and Glass Balustrades  Mosquito Screens, Persianas & Shutters  Sun Awnings and Toldos  Garage Doors and Aluminium Gates  Folding Security Shutters for Doors and Windows  Shower and Bath Screens made to measure  In-House Glazing and Double Glass Department LUX-AL is the longest established British window company on the Costa Blanca offering the highest quality products, with the best prices and outstanding service. Our products will help to make your home more comfortable, secure and maintenance free. Our factory is located in Benitachell and we have been operating in the area from Gandia to Alicante since 1989. At LUX-AL we do not sub-contract, from fabrication to ﬁtting by our own team of experienced carpenters and ﬁtters - you can be conﬁdent of our 10 year guarantee. 96 649 3447 Take advantage of our current special offers - present this advert for a fantastic 10% discount! With over 20 years’ experience designing, maintaining and supplying gardens, Charlesworth Gardens has expanded to be able to deliver all your gardening needs. From major project work covering landscape gardening, artiﬁcial grass, through to just buying a few extra plants, Charlesworth Gardens has you covered. We are the specialists in all aspects of garden construction, from walls, terraces, summer kitchens, water features and ponds, decks, stone work, everything you could imagine to create your ultimate garden space. We only supply and install quality, realistic artiﬁcial grass where you will want to sit, read, sunbathe, play with the kids and simply enjoy. We are conﬁdent that you’ll appreciate it as much as our many existing customers. Call us or visit our show area in Benitachell opposite masymas (by appointment please). At The Bed Centre we aim to make people comfortable, in fact it’s what drives us to select the best and most comfortable beds available for our customers. We are a small but dedicated team who are passionate about giving our customers the best night’s sleep whatever their budget. Back in 1992, you couldn’t ﬁnd a decent mattress let alone a divan base with drawers on the Costa Blanca and so The Bed Centre was born. Now we couldn’t be more pleased with the huge range of bed linen, headboards, bespoke beds and contemporary mattresses sourced from all around Europe. A Range for All Budgets Our Medium range is perfect for holiday homes and spare rooms and includes pocket sprung, open coil and foam mattresses with a range of divan, box-spring and ottoman (liftup) bases in a huge range of fabrics. The Budget range is great for rentals and under-builds and comprises of foam or open-coil sprung mattresses on slatted or fabric bases on legs. We choose all our products to suit the climate we live in, cool pillows and protectors to beat the heat in summer and sumptuous feather and ﬁbre duvets for the winter. Products We Love Made by People We Know We are proud of our products and of the people who make them. Our bespoke luxury range of beds, mattresses and headboards made using natural ﬁbres and sustainable materials are made to the highest standards by craftsmen at Burgess Beds, Hypnos, Dunlopillo, Swanglen, Klinun and Serta. Can’t ﬁnd what you are looking for? Contact us for your off sizes, we can source most items or have them made for you. Extra deep sheets and mattress protectors, mattresses for boats, caravans, cots or sofa beds or just that hard to ﬁnd item, let us know and we’ll do our best to ﬁnd them for you. PERSONAL SERVICE. With more than 30 years’ experience, we serve the entire Costa Blanca supplying awnings, glass curtains, mosquiteros, etc., to both domestic and business customers. EXCELLENCE & PROFESSIONALISM. With a wide range of products and professionally trained ﬁtters, we can supply and install solutions to meet your needs. INSURED & GUARANTEED. We guarantee our installations for 5 years to ensure full peace of mind. Moreover, we are fully insured for your protection. Solid, laminated and treated timber, skirting boards, cladding and terrace decking. Woodwork accessories, ﬁxings, screws, waterprooﬁng membranes, etc. HUGE SELECTION OF STOCK AVAILABLE! More than 30 different dimensions of pine timber in green, brown and thermo treated. Biggest selection of high quality joists, beams, tongue and groove boards, planks and decking boards. You have never seen such a large selection. All planed and round edges. Over 130m3 in stock! Delivery & assembly service available. We provide quality, A bespoke kitchen created locally sourced kitchens at with our excellent design affordable prices across the service giving you exactly Costa Blanca region of Spain. what you want. We’ll manage your new Arrange an appointment with kitchen from start to ﬁnish us today to discuss your new from building works to kitchen for your home on the plastering and decorating. Costa Blanca. Opening hours: Monday to Friday 9am to 6pm. Saturday 10am to 1pm. Sunday closed. Visit our showroom where our experienced staff will offer all the help and advice you need. Find us on the Poligono Ind. Les Galgues, opposite the new Mas y Mas in Pedreguer. Ample Parking. Established in 2006 · Good old fashioned customer service · Fantastic range in a 400m2 showroom · All work and products fully guaranteed Catering for all requirements from the smallest repair, to a complete recover and professional cleaning for your home, garden, car or boat. Find us on facebook “harrisfurnishings.sofamedico” to see examples of our work & client recommendations. SPRING MATTRESSES - FOAM MATTRESSES - BED BASES - STORAGE BASES GUEST BEDS - BUNK BEDS - ELECTRIC BEDS - TOPPERS - HEADBOARDS We at The Bed Shop are a family run business who pride ourselves in offering a large range of beds, mattresses and accessories at great prices. Our aim is to give our clients a personal service with the best customer care. With over 10 years’ experience we are able to advise on the best solution to suit your individual needs. We stock a wide range of products to suit every budget, from rentals to luxury living and offer fast, free local delivery and free disposal of your old beds. We make products to ﬁt your home exactly to your needs, products which enhance your home whilst adding a signiﬁcant layer of security - all maintenance free. We have been working in Spain for nearly 25 years so we understand how things work, and how to ensure our products ﬁt into Spanish buildings. We believe in the highest quality throughout and we’re conﬁdent that our prices represent simply the best on the Costa Blanca (and indeed beyond) so whatever your needs, call us and we’ll come and take a look, measure and give you a no-obligation quotation. Kitchens, Bedrooms & Bathrooms Avenida Europa Nº17 (N332) · 03720 · Benissa Church Kitchens has been trading on the Costa Blanca since 1988 and has built its enviable reputation on value for money and integrity! Our company’s success is due mainly to its staﬀ, in every way possible we all strive to give the best advice and service. Our in-house staﬀ and installers are there to serve you and help you to choose all necessary components for your new Home Improvement. We have the capabilities to carry all associated works including electrical, plumbing and tiling. Visit our NEW website to help assist you in making the right decisions. DOORS & CABINETS With so many doors available (nearly 4000 diﬀerent colours and styles), it’s diﬃcult to choose, so we try to help you decide on the right one with regard to budget and style. Our carcasses are formed from the highest standards of materials impregnated with a water resistant protection. KITCHEN APPLIANCES We work with many well known appliance manufacturers including Miele, Siemens and Smeg. You choose depending on your taste and budget. And if things go wrong down the line (as they sometimes do), we’ll even make the call for you so you don’t have to. SURFACES & ACCESSORIES We can supply a range of surfaces including granite, Techlam (porcelain), Silestone and Roxton, which is an all in one, seamless work surface. No kitchen is complete without those ﬁnal touches that make it a pleasurable and eﬃcient workplace. BATHROOMS & BEDROOMS A natural extension to our service due to our level of expertise. Create your perfect bathroom with ranges to suit all styles and pockets! Create your perfect bedroom incorporating coloured glass sliding doors and even walkin dressing rooms with all the latest accessories to make it so special. AVAILABLE IN: CHROME, WHITE OR BLACK. WINECOOLERS We have a large selection of heated towel rails in a variety of sizes and designs. Powered either electrically and/or via your existing central heating, they add elegance and comfort to any bathroom. Whether your dream wine cabinet is free standing or built-in, integrated, mounted on a bench or in a cabinet, our newest addition of wine coolers are just what you are looking for. We have a variety of sizes with single and dual compartments allowing for two diﬀerent temperature settings in each compartment to keep your wine at the right temperature. The main part of our business is based around renovating and repairing existing pools. With our full diagnosis and repair/maintenance service, we can replace valves, pipework and equipment in most cases without draining your pool as we have specialised plugs to stop water ﬂow. We supply and install Solar pool heating systems, heat pump systems, pool covers, salt systems, LED lighting systems. We also repair or replace pumps, sand ﬁlters & all other types of equipment. Contact the Proservices team of qualified professionals today for a no obligation quotation. Prosat Spain is an established company working throughout the Costa Blanca North. The main activities of Prosat are providing all the requirements that you have for your television systems, whether it be a new installation, upgrade, or a repair to your existing system. Whether it’s swimming pool products, pump or ﬁlter repairs, sand ﬁlter changes, pool cleaning and maintenance service, pool covers, pool lights, pool heating, regrouting, refurbishment or technical advice, call us now for a free quotation. HEALTHY SWIMMING. We’ve been approaching our business by thinking about you and your guests. We know you want to not only enjoy your pool, but be secure in the knowledge that there are no unseen dangers. That’s why healthy swimming has guided everything we do since we started. We’re not just talking about a sparkling blue pool, because that can at the same time be a dangerous chemical soup, but we mean a clean pool with the minimum levels of harmful chemicals in water that is free of bacteria and algae. Transform your pool area We supply and ﬁt glass balustrades. Bring your ﬂoor back to life with The pictures speak for themselves! Now also offering new stone worktops and splashbacks to complete your restoration. Take a look at our website or Facebook page and see some of our amazing transformations. Every page is colour coded for their particular trade, service or section. TIME TO SELL YOUR PROPERTY? Extensive Marketing Throughout Europe Experienced Multi-lingual Service Team Working for YOU!